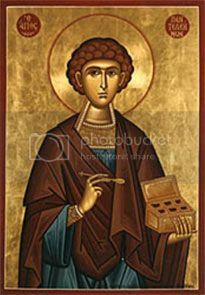 Today, July 28, we celebrate the feast day ofSaint Pantaleon the Healer (also known as Saint Panteleimon, died 303), physician, confessor, and martyr for the faith. While serving as physician to the Emperor Maximianus, Saint Pantaleon lived his faith loudly, despite persecution of Christians, and through his witness and charity to the poor and enslaved, earned the martyrs’ crown. He is considered a contemporary to Saints Cosmas and Damian, also Christian physicians who suffered for their faith. Saint Pantaleon, whose name means the “all-compassionate one,” is the patron saint of physicians.Pantaleon was born. in the city of Nicodemia (currently called Izmit, in northern Turkey near the Black Sea). 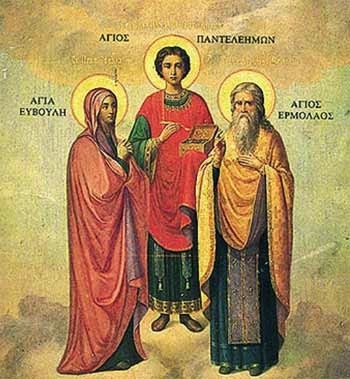 His mother, Eubula, was a devout Christian who raised her son in the Christian way of life, while his father, Eustorgius, did not convert until much later. Sadly, Eubula passed away while Pantaleon was still quite young. While he had been exposed to Christianity, Pantaleon did not fully practice as a young man. Handsome, polite, and humble, he radiated happiness and peace to all he encountered, but was drawn to worldly pursuits. His father sent him to study under a famous physician, and eventually was appointed the royal physician to the court of Emperor Maximian. While at the royal court, Pantaleon fell further from the faith, deceived by hearing the false maxims of the world applauded. It was then that the Lordsent a model of the faith, a zealous and prudent Christian named Hermolaus, to Pantaleon, to serve as advisor and friend. Hermolaus took special notice of the young physician and awakened his conscience, telling him that although the famous physicians of ancient times had possessed the science which cures bodies, Jesus Christ was a far more excellent Physician, able to cure not only bodies, but souls, by His divine doctrine. Through continued discussion and counsel, Pantaleon came to accept Christ into his heart. Soon thereafter, Pantaleon experienced a miraculous healing, saving a child from certain death after being bitten by a viper. Needing no further proof of the power of the Lord, he was baptized into the faith, and undertook a rigorous course of study on the Sacraments of the Church, Holy Communion, and the teachings and practices of the faithful. Through his faith, he subsequently cured a man of blindness, which led him to the faith. Similarly, his father, hearing of his son’s healings, converted, receiving Christ into his heart. When Eustorgus, his father, died, Saint Pantaleon liberated all his slaves on the family estate, and, having sold most of his possessions, gave to the liberated ones and others the assistance their poverty required. He cured other illnesses and soon became renowned in Nicodemia, attracting the attention of competing physicians. They wished to betray him to the Emperor, who was actively persecuting Christians. Pantaleon was ordered to appear before the Emperor, who described the charges against him. The emperor had grown to like and trust Pantaleon, and attempted to save him by offering him the chance to make sacrifice to the pagan Roman gods. Of course, Pantaleon refused, and it was ordered that he be tortured and killed. After multiple attempts to kill him—which he miraculously survived—Saint Pantaleon was beheaded. 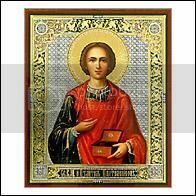 The body of Saint Pantaleon was anointed with myrrh and buried outside of the city. His remains, or a portion of them, were later translated to Constantinople, where they are venerated today. It is said that his blood, conserved in a small vial, liquefies on his feast day, becoming oxygenated. Some of his relics, including his head, were later again translated to France by Charlemagne, and reside in the abbey of Saint Denys near Paris and in Lyons. Saint Pantaleon, you know that it is hard to be ill without hope to get well again. Sometimes it is even more difficult to see someone suffer whom we love and whom we cannot help. Pray for the doctors in whom we trust. Give them wisdom and patience for the right way of treatment. You emulated God's mercy, and He granted you the power of healing, o Pantaleon, victorious martyr of Christ. Heal our spiritual diseases through your intercession, and as we constantly cry out to the Lord, 'Save us!' take away the temptations which the enemy always places before our steps. Grant, we beseech thee, Almighty God: that by the prayers of thy holy Martyr blessed Pantaleon, we may be delivered from all adversities which may happen to the body, and from all evil thoughts which may assault and hurt the soul.His feast day is 27 July, also 28 July, and 18 February.